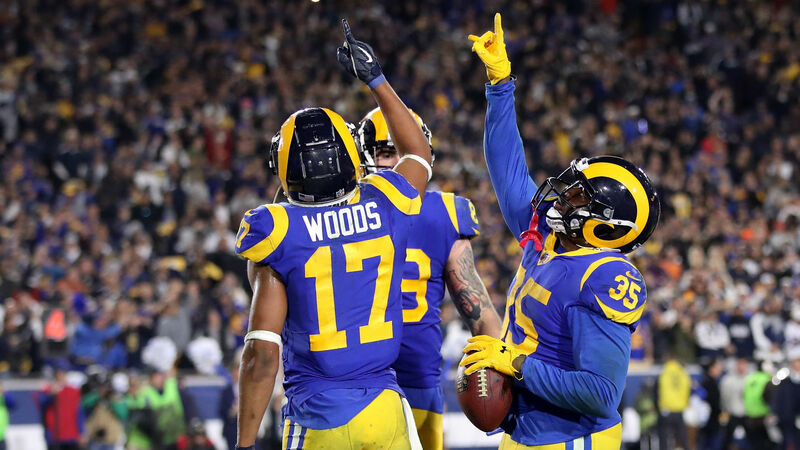 The Rams took control in the second quarter en route to a 20-7 halftime lead and then held off the Cowboys in the final minutes. Jared Goff was 15 for 28 passing for 186 yards, and his run for a first down late in the fourth quarter prevented the Cowboys from having a chance to tie. The Cowboys had no answer for the Rams’ running game in general. C.J. Anderson finished with 23 carries for 123 yards and two touchdowns. Todd Gurley, who was back after missing time with a knee injury, was a difference-maker as well. He had for 115 yards and a touchdown. In all, LA rushed for 273 yards on 48 attempts. Dallas QB Dak Prescott finished 20 for 32 with 266 yards and a touchdown through the air. He also rushed for a touchdown. Amari Cooper caught the touchdown pass. Sporting News provided live updates throughout the contest. 11:16 p.m.: The clock winds down. The Rams win and will advance to the NFC championship. 11:15 p.m.: C.J. Anderson goes 6 yards up the middle to the 50-yard line. 11:13 p.m.: Jared Goff keeps it, taking it 11 yards for a huge first down. 11:02 p.m.: TOUCHDOWN, Cowboys. Dak Prescott keeps and takes it in from the 1. The play was reviewed and stood as called. The extra point is good. Rams 30, Cowboys 22. 11:00 p.m.: Aqib Talib is called for pass interference in the end zone, setting up a first-and-goal. 10:56 p.m.: The Cowboys’ fourth-down attempt is successful with a Dak Prescott 2-yard keeper. 10:50 p.m.: Dak Prescott passes deep down the middle to Michael Gallup for 24 yards. 10:47 p.m.: TOUCHDOWN, Rams. Going for it pays off. C.J. Anderson takes it in from the 1. The extra point is good. Rams 30, Cowboys 15. On fourth and goal… @cjandersonb22 is IN! 10:46 p.m.: The Rams line up to go for it on fourth-and-goal and then attempt to draw the defense offside. The Rams take a timeout. They come back out on offense and will still go for it. 10:41 p.m.: Jared Goff’s pass is complete for 18 yards to Robert Woods to the Cowboys 19 yard line. 10:37 p.m.: The Cowboys fourth-and-1 attempt is no good as Ezekiel Elliot is stopped before the first down marker. Turnover on downs. 10:33 p.m.: Dak Prescott completes a 13-yard pass to Noah Brown, who catches it on the sideline and is pushed out of bounds. 10:31 p.m.: Dak Prescott’s pass to Cole Beasley is complete for 15 yards. 10:26 p.m.: The Rams are called for delay of game on what looked to be a setup for a fake punt. The Rams punt on the next play. 10:16 p.m.: TOUCHDOWN, Cowboys. Ezekiel Elliot rushes in from 2 yards out. Dallas goes for two and converts as Prescott passes to Amari Cooper. Rams 23, Cowboys 15. 10:14 p.m.: The ruling on the field stands. The Rams lose the challenge and a timeout. 10:12 p.m.: The ruling on the field is a completed pass to the 2-yard line after a Dak Prescott passes to Michael Gallup for 44 yards. The Rams are challenging the ruling. 10:10 p.m.: The Cowboys are successful on their fourth-and-1 attempt with a 5-yard rush by Ezekiel Elliott. 10:09 p.m.: The Cowboys are a yard shy of the first down after a 10-yard pass to Michael Gallup. They’ll go for it on fourth-and-1. 10:03 p.m.: FIELD GOAL, Rams. Greg Zuerlein’s 44-yard field goal attempt is good. Rams 23, Cowboys 7. 10:02 p.m.: Jared Goff fumbles a handoff but falls on the football. 9:59 p.m.: The Rams march down the field with a Jared Goff pass deep to Brandin Cooks for 21 yards. 9:55 p.m.: The Cowboys go three-and-out on the first drive of the second half. 9:40 p.m.: Greg Zuerlein’s 63-yard field goal attempt is no good. That ends the first half. 9:35 p.m.: Jared Goff’s pass is complete Todd Gurley for 7 yards and a first down. 9:24 p.m.: TOUCHDOWN, Rams. Todd Gurley takes it to the house on a 35-yard rush. The extra point is good. Rams 20, Cowboys 7. 9:22 p.m.: Jared Goff connects with Brandin Cooks for 15 yards. 9:12 p.m.: TOUCHDOWN, Rams. C.J. Anderson scores on a 1-yard rush. Extra point is good. Rams 13, Cowboys 7. 9:10 p.m.: C.J. Anderson runs 14 yards up the middle to the Dallas 1. 9:07 p.m.: The Rams get close to Cowboys territory with a 20-yard pass from Jared Goff to Brandin Cooks. 9 p.m.: Dak Prescott’s pass is complete to Dalton Schultz for 20 yards. 8:56 p.m.: FIELD GOAL, Rams. Greg Zuerlein’s 23-yard kick is good. Cowboys 7, Rams 6. 8:56 p.m.: The Cowboys stop the Rams on third down and force them to attempt a field goal. 8:51 p.m.: The ruling on the field is a Rams touchdown. After further review, the ruling on the field is changed to an incomplete pass. 8:43 p.m.: C.J. Anderson runs up the middle for a 15-yard gain. 8:41 p.m.: The Rams are successful on their fourth-and-1 try. 8:33 p.m.: TOUCHDOWN, Cowboys. Dak Prescott’s pass is complete down the middle to Amari Cooper for 29 yards and a touchdown. The extra point is good. Cowboys 7, Rams 3. 8:31 p.m.: The Cowboys go for it on fourth-and-1 and pick up the first down. A 15-yard penalty on the defense after the play pushes the Cowboys farther down the field. 8:29 p.m.: Dak Prescott completes a pass to Blake Jarwin for 13 yards and a first down. 8:24 p.m.: FIELD GOAL, Rams. The Rams are on the board first with a Greg Zuerlein 25-yard field goal. Rams 3, Cowboys 0. 8:23 p.m.: The Cowboys stop the Rams on third down, forcing a field goal attempt. 8:22 p.m.: C.J. Anderson goes 12 yards up the middle into the red zone. 8:17 p.m.: Jared Goff connects with Tyler Higbee for 19 yards. 8:17 p.m.: The Rams will start on offense.